Why not Follow The Rattlesnake? I love the green blends! feels like a foggy day with rays of sunshine just on the subjects. thats soooo cool what did you do? Awesome picture! May I have permission to share this on my Facebook author page? I will, of course, give you credit. Thanks so much for sharing your amazing talent with us! I love wolves! 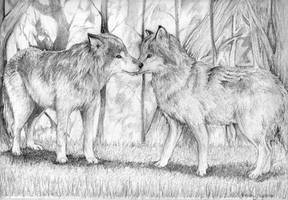 I love it, it is so beautiful, the wolf is gorgeous and I love the green woods. reminds me of Shiver series. wow howd she get that close to the wolf? soo the girl didint really get that close to the wolf? No, i don't believe so. Also, if you look at the area around where the girl is near, it does not look similar to where the wolf actually is. But it is a beautiful picture. I love this brilliant work of art! The colours and shadowing make it look so....so...Well, the artwork is just magnificent! I love wolves, and this was a major treat for me, and I'll bet it was very fulfilling to complete! A really nice piece, very captivating. And Traslate it, please xD! most amazing. awesome song too! i love the colors and the wolf is beautiful. I love that song, and the band. Beautiful picture. This is so enchanting, I wish I was that girl. Simply marvelous! I love this picture, absolutely beautiful. Wow this is really moving. I like this picture, how did you take it? Did you digitally add in the wolf? I really, really, really like this!! Cool! I will have to go check em' out! I really really like this one, I wish I had the money to buy it.